A legal battle over a 10,600-year-old skeleton – called "Spirit Cave Mummy" – ended after advanced DNA sequencing revealed it was related to a Native American tribe. The revelation was published in Science today as part of a large international study that has genetically analyzed the DNA of a series of famous and controversial ancient remains in North and South America including the Cave of the Spirit, the skeletons of Lovelock, the remains of Lagoa Santa, an Inca mummy and oldest remains of Chilean Patagonia. The study also examined the oldest human remains of Trail Creek Cave in Alaska, a 9,000-year-old baby tooth from a young girl. Scientists sequenced 15 ancient genomes from Alaska to Patagonia and were able to track the movements of early humans as they spread through the Americas at "staggering" speeds during the Ice Age, and also how they interacted among them in the following millennia. The team of academics not only discovered that the Cave of the Spirit remains – the world's oldest natural mummy – was a native American but was able to reject a long-held theory that a group called Paleoamericans existed in North America before the Native Americans . Innovative research has also uncovered evidence of a mysterious Australasian genetic signal in the 10,400-year-old remains of Lagoa Santa from Brazil that reveal a previously unknown group of early South Americans – but the Australasian link left no genetic trace in North America. It was described by one of the scientists as "extraordinary proof of an extraordinary chapter in human history". 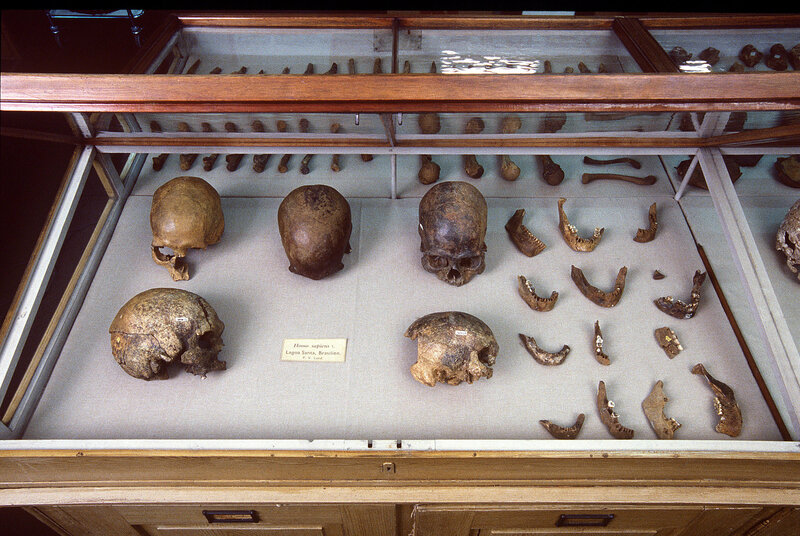 Professor Eske Willerslev, who has held positions at both St John's College of the University of Cambridge, and at the University of Copenhagen, and led the study, said: "Spirit Cave and Lagoa Santa were very controversial because identified as the so-called "Paleo-Americans" based on craniometry – it was determined that the shape of their skulls was different from the current Native Americans.Our study shows that Spirit Cave and Lagoa Santa were actually genetically closer to Native Americans contemporaries than any other ancient or contemporary group that has been sequenced until today. " The remains of Lagoa Santa were recovered by the Danish explorer Peter W. Lund in the nineteenth century and his work led to this "paleoamerican hypothesis" based on the cranial morphology that theorized the famous group of skeletons that could not be native Americans. But this new study denies this theory and the results were launched under embargo by Professor Willerslev with representatives of the Brazilian National Museum in Rio Tuesday, November 6, 2018. He added: "Watching the bumps and the shapes of a head does not help to understand the true genetic genealogy of a population – we have shown that you can have people who seem very different but closely related". The scientific and cultural significance of the remains of the Cave of the Spirit, which were found in 1940 in a small rocky alcove in the Great Basin Desert, was not properly understood for 50 years. The preserved remains of men in their early forties were thought to be between 1500 and 2000 years, but during the 1990s the new tests on fabrics and hair dated the skeleton to 10,600 years. The Paiute-Shoshone tribe of Fallon, a group of Native Americans based in Nevada near Spirit Cave, claimed cultural affiliation with the skeleton and called for the immediate repatriation of the remains under the law of protection and repatriation of the natives Americans. The request was refused because the offspring were disputed, the tribe denounced the federal government and the case denounced the tribal leaders against the anthropologists, who claimed that the remains provided priceless insights into the first inhabitants of North America and should continue to be exposed in a museum. The stalemate continued for 20 years until the tribe accepted that Professor Willerslev could perform the sequencing of the genome on DNA extracted from the Cave of the Spirit for the first time. Professor Willerslev said: "I assured the tribe that my group would not take the DNA test unless they gave permission and agreed that if Spirit Cave were genetically a native American, the mother would be repatriated to the tribe. ". The team carefully extracted the DNA from the petrus bone from the inside of the skull showing that the skeleton was an ancestor of the current Native Americans. Spirit Cave was returned to the tribe in 2016 and at the start of this year there was an official burial ceremony that Professor Willerslev attended and details were just released. The geneticist explained: "What has become very clear to me is that it was a deeply emotional and deeply cultural event: the tribe has real feelings for Spirit Cave, which as a European can be difficult to understand, but for us it would much like burying our mother, father, sister or brother. "We can all imagine what it would be like if our father or mother were exposed in an exhibition and had the same feeling for Spirit Cave, and it was a privilege to work with them." The tribe was kept informed throughout the two-year project and two members visited the Copenhagen laboratory to meet the scientists and were present when all the DNA was taken. A statement from the Paiute-Shoshone tribe of Fallon said: "The tribe has had a lot of experience with members of the scientific community, mostly negative, but there are a handful of scientists who seemed to understand the tribe's perspective and Eske Willerslev was one of their. "He took the time to familiarize himself with the tribe, kept us well informed of the process and was available to answer our questions. His new study confirms what we have always known from our oral tradition and other evidence-that we man taken from his last resting place in Spirit Cave is our native American ancestor. " The genome of the Spirit Grotto skeleton has a broader meaning because it not only solves the legal and cultural dispute between the tribe and the government, but also helps to reveal how ancient humans moved and settled across the Americas. Scientists were able to monitor the movement of populations from Alaska to the south to Patagonia. They often separated from one another and risked traveling in small pockets of isolated groups. Dr. David Meltzer, of the Department of Anthropology, Southern Methodist University, Dallas, said: "A surprising thing about the analysis of Spirit Cave and Lagoa Santa is their close genetic resemblance that implies their ancestral population traveled through the continent at surprising speed.This is something we suspected because of archaeological discoveries, but it is fascinating to have confirmed it by genetics. These discoveries imply that the early peoples were highly qualified to move quickly through a completely unknown and empty landscape. traveling at great distances at breathtaking speed. " The study also revealed surprising traces of Australasian ancestry in ancient South American Native Americans, but no Australasian genetic link was found in North American Native Americans. Dr. Victor Moreno-Mayar, of the Center for GeoGenetics, University of Copenhagen and first author of the study, said: "We discovered that the Australasian signal was absent in the Native Americans before the Cave of the Spirit and the population division of Lagoa Santa which means carrier groups this genetic signal was already present in South America when the Native Americans reached the region, or the Australasian groups arrived later. This signal was not previously documented in North America implies that a previous group that owned it had disappeared or a subsequent group arrived through North America without leaving a genetic trace. " Dr. Peter de Barros Damgaard, from the Center for GeoGenetics of the University of Copenhagen, explained why scientists remain perplexed but optimistic about the Australasian ancestry signal in South America. He explained: "If we hypothesize that the migratory route that brought this Australian ancestry to South America passed through North America, the carriers of the genetic signal arrived as a structured population and went directly to South America where they subsequently mixed with new arrivals groups, or have entered later, at the moment we can not solve which of these could be corrected, leaving us in the face of extraordinary evidence of an extraordinary chapter in human history! But we will solve this enigma ". The history of the population during the millennia that followed the initial settlement was much more complex than previously thought. The population of the Americas had been simplified as a series of divisions between the north and south population had virtually no interaction between the groups after their foundation. The new genomic analysis presented in the study showed that about 8,000 years ago the Native Americans were moving again, but this time from Mesoamerica to North and South America. The researchers found traces of this movement in the genomes of all the indigenous populations of South America for which genomic data are available. The dott. Moreno-Mayar added: "The oldest genomes of our study have not only taught us the first inhabitants of South America, but they have also served as a basis for identifying a second flow of genetic ancestors, which came from Mesoamerica in the last millennia and which is not evident from the archaeological documentation: these Mesoamerican peoples have mingled with the descendants of the early South Americans and have given rise to many contemporary groups in the region ".